As we near SWTOR's first anniversary, I have finally hit the level cap of 50! I take things pretty slow, and SWTOR was no exception. With the focus on Legacy and Alts, it just made it even harder to dedicate myself to one character. It soon became apparent that BioWare was putting a major focus on adding content to the endgame like Operations and new Daily zones. The addition of HK-51, which starts in the newly added Section X area, is another major motivator. So I buckled down and got my Trooper to 50. I have not completed Chapter 3 of my class story yet as I am taking a small breather and catching up my crafting. The question now is, what's next for Werit the Trooper? Gear. Before hitting the new Daily Zones, I'd like to improve my gear via crafting. My Armstech is at 400, so I am working toward making Advanced Commando Barrel 22's for me and my companions. My Jedi Knight can make Armoring mods (and Mods), so I will do the same with him. Daily Zones. I plan on doing The Black Hole and Section X at least once just to check them out. 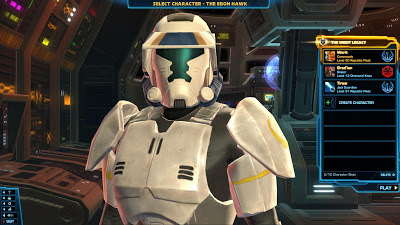 HK-51. Got to get my very own Assassin Droid! PvP. My Valor currently is at Level 37. I'd like to get that up a bit, at least to 40 soon so I can start getting into the better gear. Story Mode Operations. Currently, only two of SWTOR's Operations have a Group Finder enabled Story Mode: Eternity Vault and Karraga's Palace. I'd like to run through these just to see the bosses and environments. After all of that, it's probably back to playing on my alts.